In 2001, I wasn't sure what I was going to do with myself. I think I was working at a pre-press service bureau at the time (if you even know what that is, you might be at least as old as me!). I had been back in Michigan for a while after having gone broke living in New York for a couple years. I remember sitting at the beach, staring out at Lake Michigan and reading Taking Your Talent to the Web. Thirteen years later, I'm thinking "what an embarrassing email to send." Jeffrey was kind enough to respond and humor me. The email wasn't much, but it was pivotal to me. I'm a "good designer"? Holy sh*t! I knew I was going to do my best to work in web design and development from that point forward. 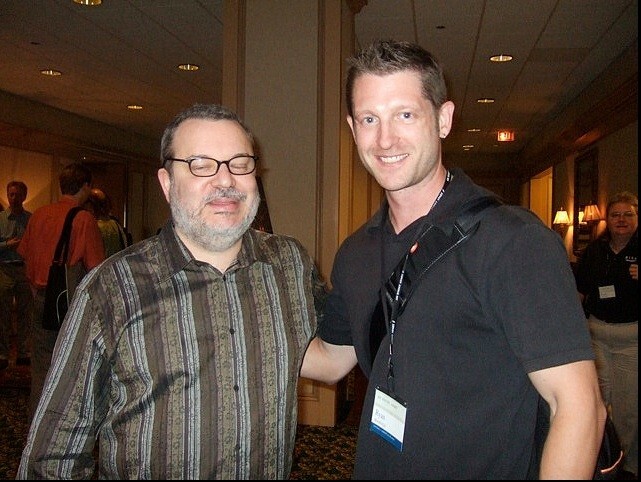 With Jeffrey Zeldman, An Event Apart, Chicago, 2007. These days I manage a successful web development business. I'm fortunate to have a talented team around me. We problem solve for some great clients, and we build our own products. I've had the pleasure to speak to Jeffrey at a couple web conferences. Before you dismiss a beginner's work, remember how much you sucked when you started. You probably sucked worse, actually. This is true. I usually try to respond to every email, and I keep it positive even if the person's work isn't all that great. 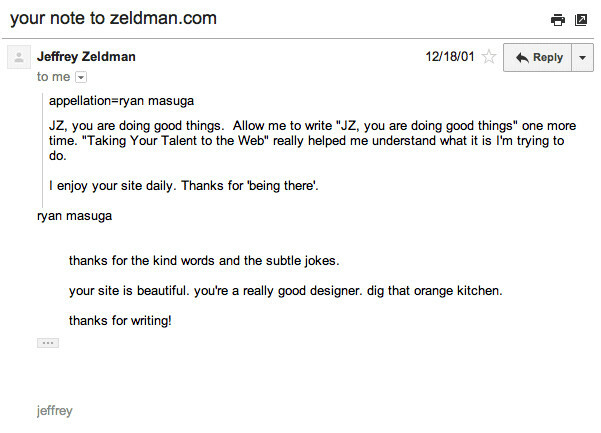 When I wrote to Mr. Zeldman, I sucked, but that didn't stop him from being encouraging. Many years of hard work later, things have turned out pretty well for me: when I visit that same beach where I was reading that book so long ago, it's with my wife and kids, and only a short walk from a little beach house we like to rent for a week in the summer. An acknowledgement doesn't have to be much - a "thanks for saying 'hi', keep it up!" can suffice, but this simple response might be enough to make a difference for someone else who is in the same position I was in.